I'm The Gun from Mark Engebretson on Vimeo. Flamingo opened Jay’s Longhorn on June 1, 1977. Already veterans, the band started as Prodigy and performed at venues across Minnesota, including the Blitz Bar, which was located across the street from Jay’s Longhorn. 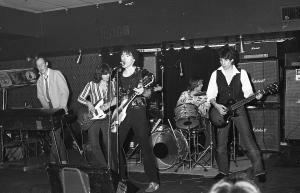 Wilkinson recalled hanging out at the Blitz Bar with members of the Suicide Commandos and Curt Almstead. Flamingo put out a four-song EP in 1978 that included “Smart Girl,” “We Do What We Like,” “One More Night,” and “I Remember Romance.” After changing their name to the Flamin’ Oh’s, they put out a self-titled LP on Fat City Records in 1980, followed by “Oh!” in 1981. They released “Long Live the King” in 2005 and “Here and Now” in 2015. See the complete discography here and current gigs on the Flamin’ Oh’s website. The video here is “I’m The Gun,” performed September 24, 2016, at Flamingo’s 40th anniversary celebration.